Michaella McCollum Connolly and Melissa Reid were found guilty of trafficking cocaine. TWO WOMEN ON trial in Peru for trafficking cocaine have been sentenced to six years and eight months each in jail. 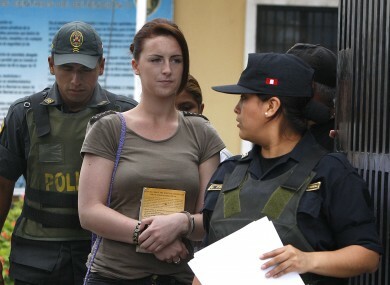 Michaella McCollum Connolly from Tyrone and Melissa Reid who is from Glasgow, known as the ‘Peru 2′, were arrested in August as they were attempting to leave Lima for Spain. The two were detained after 11.5kg of cocaine was found hidden in food packets in their luggage. The two pleaded guilty in September to attempting to smuggle the drug out of Peru. Initially they had denied the charges and said they were coerced into smuggling by an international cartel. However they changed their story and said that they “knew they were going to transport drugs, and that they regret having participated in such an act,” according to the court. Email “‘Peru 2′ sentenced to 6 years and 8 months in jail each”. Feedback on “‘Peru 2′ sentenced to 6 years and 8 months in jail each”.